Last Week – We finished February with a beautiful, upbeat run to Winchester for 20 miles and 10 miles. The temperature was in the mid-30s, but the bright sun and lack of wind made the day feel like the warmest of the year. As they tackled the longest run of the season, runners were up beat at the water stops manned by Hank, Lois, Tom, and Audrey. This Week – Then came March like a Lion! With a large snow fall, lazy shovelers, and consistently freezing temperatures, running this week has been abysmal. If you do find a stretch of shoveled sidewalks it tends to end at a 4ft snowbank on a corner. As the days warm, the snow will melt and then form into slick patches of ice by morning. Needless to say, we won’t be running Breakheart this week with snow and ice covering its paths. We will run Lake Q and return to Melrose for a trip around Breakheart. With Black Cat today and the Malden “Block Party” Half Marathon tomorrow, I suspect the crowd will be light at the SLR. Start-1 – We’ll be running up Main Street, past Ell Pond, all the way in to the Wakefield, stopping at Nick’s Pizza for a water stop. Half-2 – Continue up Main Street through Wakefield Center, bearing left onto Common Street, turning left on Church St at Lake Quannapowitt, and then turning left at the traffic lights at North Ave. This will bring you back to the water stop at Nick’s. Half-Finish – Run back Main Street to Brueggers to finish up your 8 mile run. Full-2 – Continue up to Lake Quannapowitt by taking Main Street through Wakefield Center, staying to the right of the lake. Turn left on to Lowell St and then a quick left on to Lake Quannapowitt Parkway. Run through the parking lot to a left on North Ave and take North Ave straight back to Nick’s for another water stop. Full-3 – Next we’ll run along Nahant over to Wakefield High School. Since Breakheart is snowed in, we’ll turn left on to Farm Street, left on Water Street and left back on Main Street in Wakefield Center. Return to Nick’s Pizza for another water stop. Full-4 – Return to Melrose along Main Street, passing Brueggers, passing Marathon Sports, and look for a water stop on the left in the parking lot at Sullivan Tire (Formerly Montvale Tire) for a quick water stop. Full-Finish – Continue on Main Street up past Pine Banks Park. Enter in to Malden, turning left on Forest Street. Forest will take you over to Lebanon Street. Run on Lebanon taking a left on East Foster. When you get to Main Street you’ll take a right to finish at Brueggers for about 16.7 miles. Water Stops – I’ll be gone this week, so Lois Parker Carmona will lead the way this week. With the change in route there will be two stops, one at Nick’s you’ll see several times, and one at Sullivan Tire for the Full runners. Thank you Lois and your band of water stop helpers! Roll Call! – Who’s in? Last Week – We endured our harshest Sunday Run yet. Despite constant rain fall and temperatures hovering in the mid-30s, over 25 runners took to the streets of Melrose, Malden, Medford, and Wakefield to get a 9 mile or 18 mile run in. Big thanks to Hank, Lois, and Tom for taking care of the food and drink that fueled a very tought, character building, run. Each season there is a run in which more than the miles challenge you, those are the most memorable runs. Running Shoes – Its time to look at the bottom of those running shoes you’re wearing. You’ll likely see all these miles you’ve been running have started to wear this pair out. This is a good time to hit up the running shoe store and get yourself another pair. You’ll either be breaking in the pair you will toe the starting line with, or you’ll save the tread on this pair by only using it for long runs here on out. Either way, plan ahead so you have a good pair of racing shoes for the big race. This Week – We take on one of the long ones. For the marathon trainers its a 20 mile jaunt to the cusp of Arlington, and for the half marathon trainers there’s 10 miles that bring you into the Winchester Highlands. Start – This week everyone starts down Main Street to West Wyoming where they’ll take a right and run up past Grimsby’s to Spot Pond. Turn right at the pond, past the Stone Zoo, past Friendly’s, straight onto North Border Rd. Continue to a set of lights where you’ll turn left on Marble Street. Marble will become Forest Street as you enter Winchester, where you’ll find a water stop tucked in on Eugene Drive. Half 2 – The half runners will continue with the long runners, heading down Forest Street and turning left on Highland Ave where the Winchester Hospital direction sign is. Continue on Highland until you find a little park on the right side at the corner of Eaton Street. Turning right on Eaton will bring you down to Washington Street where you’ll turn right. Continue on Washington to the Gingerbread Construction Company and turn right on to Forest Street. Run up, up, and up Forest Street until you find the water stop at Eugene again. Half Finish – The final leg of the half run will take you back to Melrose the way you came. Go over I-93 on Forest Street as it becomes Marble Street. At the set of lights turn right on Park Street which becomes North Border Road, taking you back past Friendly’s. Continue straight as you go past the Stone Zoo to where Pond Street turns left to head towards Melrose. Run straight past Grimsby’s onto West Wyoming, then turn left on Main Street and get back to Brueggers to finish your 10 Mile run! Long 2 – The long runners will head down Forest and turn left on Highland with the half runners. Continue straight on Highland, past Winchester Hospital, past where the half runners turn, straight through a 5-way intersection staying on Highland, all the way to the end of Highland where you’ll find a water stop. Long 3 – You’ll venture into new terrain for this section. Turn left on Main Street/Rt38 and head to Medford. Cross to the right side of the road and as you run along the wall of the Oak Grove Cemetery, turn right at Playstead Road. This will continue along the cemetery, past a soccer field, along the commuter rail to High Street in Medford. You’ll turn right on High, cross the train tracks, and if you must the Dunkin Donuts has been a convenient rest stop for many years. Continue on High Street, making sure to keep left to stay on High where Grove Street forks off. DO NOT GO ONTO GROVE STREET. High will bring you to the source of the Mystic River. Do not cross the Mystic or you’ll be in Arlington and we don’t go to Arlington. Instead turn right on the Mystic Valley Parkway at the little rotary. Follow this past the Mystic Lakes, which feed the Mystic River, until you get to what seems to be the end of the Mystic Valley Parkway where you’ll turn right on Bacon Street. Follow Bacon under the commuter rail and then take your first left onto Mystic Valley Parkway (told you it wasn’t the end). This part of the Mystic Valley Parkway runs along the Aberjona River, which feed the Mystic Lakes. Along this stretch will be a water stop which feeds you. Long 4 – Continue along the Mystic Valley Parkway, going through a set of traffic lights and then turning left at the next set of lights on to Washington Street. Washington will take you through a five way intersection where you cross Mt Vernon Street and keep right to stay on Washington. If you run past Winchester High School, well you didn’t learn from your mistakes the last time we ran through here and are likely to be lost for a while. Washington will cross Winchester taking you over to the Gingerbread Construction Company where you could buy a muffin but won’t, you’ll instead turn right onto Forest Street and head back up, up, up to the water stop at Eugene Drive. Long 5 – After this water stop you’ll continue on Forest over I-93 as the road becomes Marble Street. You’ll turn right at the lights onto Park Street and continue as that becomes North Border Road. At Friendly’s you’ll turn right onto Main Street and continue as that becomes the Fellsway West. Turn left on Elm Street, which will stay Elm Street all the way up to the rotary at the other Highland Ave. Turn right onto Highland and look for a stop right after you turn. Long Finish – The final leg of this journey will take you down Highland all the way to the traffic circle at the Fellsway East. Turn left and follow the Fellsway East through our version of Heartbreak Hill as you make your way to Grimsby’s. Here you will happily remember that you can take a right on West Wyoming and a left on Main to finish your 20 Mile run at Brueggers! Water Stops – There are quite a few stops this week. We should have Hank, Lois, Tom, Audrey, and myself out there helping you move along. Last Week – We had about 35 runners hit the roads, stopping by Friendly’s on their way to a cold but solid training run. Thanks to Hank, Lois, and Haecha for supporting the water stops and getting everyone where they needed to go. This Week – Normally we would go to Breakheart this week, but with two little snow falls through the week we know the hilly side will be unrunnable. With warm temperatures in the day causing snow melt on the cleared pathways, followed by cold nights freezing that moisture into black ice, the flat side won’t safely be runnable. So no Breakheart. In the spirit of the Malden Half Marathon I could have you all run laps of the MRC 3 Mile Summer Route. Too soon? Instead I’ve created a new route, combining parts of other routes, to get close to 9 and 18 (they’re both a little short so you may want to wander around a little at the end. Start – Everyone starts together, running up East Foster to Melrose Common. Take a right on 6th Street and follow that as it turns in to Swains Pond Ave. This will take you up to Swain’s Pond, to a stop sign where you turn right to stay on Swain’s Pond Ave. Swain’s Pond Ave will end at Lebanon Street. Some have been fooled into thinking Swain’s Pond Ave continues into Malden, watch for the turn to go right on Lebanon back towards Melrose. At the next set of lights turn left on Forest Street. Follow that to the end, Main Street in Malden, across to the Citizens Bank and a water stop. Next Step – Leave the Citizens Bank parking lot onto Winter Street. This will take you past the Oak Grove T Station to a 5-way intersection. Cross straight onto Glenwood Street and follow that to it’s end at Highland Ave. Turn right on Highland, through the traffic circle (be careful!) to continue on Highland Ave on the other side. 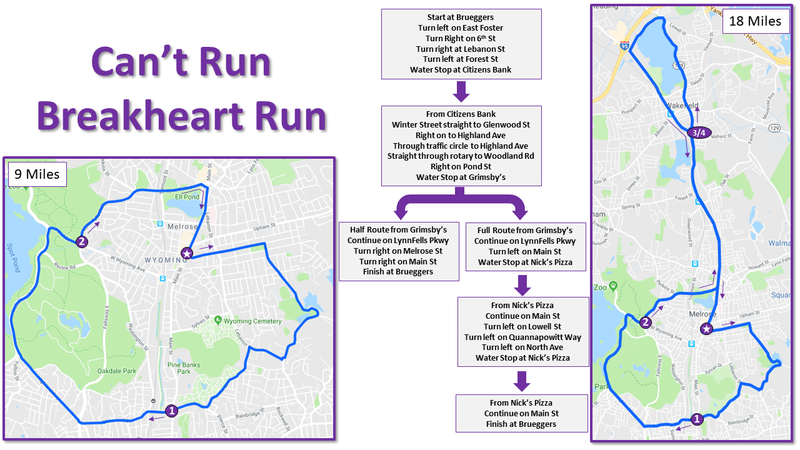 Take Highland to the highland rotary where everyone continues straight onto Woodland Rd, passing the Flynn Rink, and running on the Melrose side of Spot Pond. At Pond Street, turn right down to Grimsby’s for a water stop. Half Finish – Everyone will run the Lynnfells Parkway towards Melrose High School. Half route runners will turn right on Melrose Street, and right again on Main Street. As you come up to Brueggers your Garmin will be telling you you’ve run about 8.6 miles. If you really want 9, wander a bit, maybe up to Wyoming and back. Full 3 – Again, everyone will run the Lynnfells Parkway towards Melrose High School. Full route runners will turn right on Main Street and head to Wakefield. When you hit Nick’s Pizza, you’ll find a water stop. Full 4 – Time to run around Lake Q. Follow Main Street through Wakefield Center, up to the east side of the lake. Turn left at the end of Main St, onto Lowell Street, then left again onto Quannapowitt Way. Make your way across to North Ave and turn left. I have you going straight along North Ave back to the water stop at Nick’s. Since this route is slightly short, you may want to opt to turn left on Church St and back Main St for a little extra. Either way, see you at Nick’s! Full Finish – After Nick’s, run Main Street back to Melrose, back to Brueggers. Do what you have to be content you ran 18 miles. Water Stops – I know Hank and I will be there. Anyone else? Last Week – About 30 of SLR runners made their way out to Winchester, with about a dozen winding their way through Winchester Highlands, and a couple taking it to the trails of the Fells. The weather was cold when you were facing the wind, but quite comfortable when the wind was at your back. The hills on that route worked those Boston muscles, getting people one step closer to Heartbreak Hill. This Week – We’ll be heading back out to Spot Pond, but in a slightly different way to mix up where we hit the hills. The full route will circle the backside of the pond, but then head out to the Fellsway East hills. The half route is very much the same as last week’s route, with a trip to Friendly’s instead of Winchester. It will be cold, but Week 7 has been a notoriously snowy weekend each winter, so take the sunshine and 20s with a smile. The Start – The whole crew will head up Main Street, past Ell Pond where you can tip your hat to Clarence DeMar. If this is your first season with us, you may not have noticed that there is a monument to Clarence DeMar along Ell Pond, remembering a legendary Boston Marathoner who lived and trained in Melrose a century ago. After you pass Clarence, continue on to Franklin Street, where you’ll turn left and climb up to Stoneham. Unlike last week, you’ll continue on Franklin all the way to Stoneham Square, turning left at the end of Franklin on to Main Street. Main Street will bring you up towards Spot Pond. Cross to the right side for a water stop at Friendly’s 4 miles into your run. Half Finish – Close out your half route, turn left at the lights onto South Street, which will become Pond Street. Follow that past the Stone Zoo and turn left to bring you down to Grimsby’s. Turn left onto the Lynn Fells Parkway, run up past Melrose High School, turning right onto Melrose Street and right again onto Main to finish up your 7.2 Mile run. Full 2 – The long route will head out straight from Friendly’s around the back side of Spot Pond. Run along the Fellsway West, past the Sheepfold and turn left when you get to Elm Street, which will bring you up to the Highland rotary. Turn right this week, following Highland Ave. The water stop will be somewhere along Highland, find it for your next drink. Full 3 – Leaving the water stop continue along Highland Ave to the traffic circle at the Fellsway East. Now climb up towards the eastern section of the Middlesex Fells, over the two hills I know you’re growing to love, and wind down yourself down to Grimsbys. Turn left and do your best to climb Pond Street back up to Spot Pond. Turn right, pass the Stone Zoo and head back to Friendly’s. Have another drink before finishing your long run. Full Finish – Head back up Main Street to Stoneham Square, turning right on Franklin Street. Continue back to Main Street in Melrose where you turn right to get back to Brueggers after 14.3 miles behind you. Water Stops – Two water stops, manned by a combo of at least me, Hank, and Lois. I may run the middle part of the long run if we get enough volunteers. 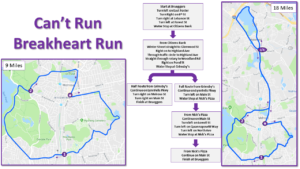 Last Week – I sent you all off to run to Saugus, where the half runners turned around and came back and the long runners headed for the Wakefield entrance to Breakheart. I’m not sure what happened when they got there, as a little snow and freezing temperatures made for some slippery steps. Whatever they did, they all came back to Melrose eventually, settling in for an afternoon of Super Bowl watching where the local team pulled off another championship. This Week – We’ll head out to Winchester for one of my favorite routes. Start – Heading north on Main Street, we’ll leave Melrose by taking a left on Franklin Street. Following this up a hill into Stoneham, we’ll run past their high school, past a Dunkin Donuts, to a set of lights where we’ll turn left on to Summer Street. Summer will wind over to Main Street in Stoneham, where you’ll cross over onto Marble Street. Marble takes you to an overpass of I-93 into Winchester where the road turns in to Forest Street. On your left you’ll find the water stop on the corner of Eugene Drive. Half Finish – The half route runners will turn back over I-93 to a set of lights on the corner of Park Street. There they’ll turn right which will take them over to Friendly’s in Stoneham. Cross Main Street and continue straight to Pond Street, past the Stone Zoo and turning left to stay on Pond Street down to Grimsby’s. To get your 8.2 miles in you’ll turn left at Grimsby’s onto the Lynn Fells Parkway, running past Melrose High School, and turning right on Melrose Street, and another quick right onto Main Street to finish up at Brueggers. Full 2 – After leaving the water stop to continue on Forest Street, runners will turn left on Highland Ave towards Winchester Hospital. As you approach the hospital, turn left onto Reservoir Road. This will bring you up to the edge of the Middlesex Fells, with a view of Winchester’s North Reservoir. As the road becomes Hillcrest Parkway, enjoy the views as this will be the prettiest street you run on a MRC Sunday Run. The road will eventually bring you back to Highland Ave where you’ll turn left. You’ll reach a 5-way intersection where you’ll continue straight across to stay on Highland Ave. At the end of Highland you’ll find a water stop. Full 3 – Leaving the water stop, turn right on to Main Street in Winchester. You’ll run up to a rotary, as you circle it counterclockwise you’ll pass a little spur street and then turn on the second street to stay on Main Street. There is a sign for Symmes Farm Historical Site as a landmark to tell you you’re on the right road. Stay to the right side of the street, as you’ll come to a fork where Main goes left, you want to stay right to run on to Washington Street. Washington will take you to another 5 way intersection. Cross Mt Vernon Street and stay to the right to keep on Washington Street. If you run past Winchester High School you went the wrong way. Washington will eventually take you to Forest Street, the Gingerbread Construction Company will be the landmark to note that its time to turn. Go right on Forest and climb up a series of hills to get back to the water stop at Eugene. Full 4 – Leaving the water stop you’ll go over I-93 and turn right at the lights on to Park. Run to Friendly’s and turn right on to Main Street/Fellsway West. This will take you over I-93, past the Sheepfold, under I-93 to Elm Street where you turn left. Elm will take you up to a rotary where you go left and find Flynn Rink. The final water stop will be in the skating rink parking lot. Full Finish – To finish up the long run continue on Woodland Road to Pond Street, where you turn right to make your way down to Grimsby’s. Continue straight onto West Wyoming and run to Main Street in Melrose. Turn left and finish up at Brueggers. AltHalf Finish – The alternate half route runners should have followed the Full 2 and Full 3 sections. After that you still have a few miles more before finishing. Go with the full route runners onto Forest to the set of lights where you turn right onto Park. When you get to Friendly’s turn left on Main Street. Main will take you to the intersection with Marble Street where you turn left. Marble will take you back over I-93 to Eugene Drive where you can carpool back. Water Stops – Hank, Tom, and I can handle this, but if anyone wants to help us out, let me know.